Back in 2015, I stayed a few nights in Yambuk, west of Port Fairy, in a house just down the road from the Yambuk cemetery. Set on flat land, the headstones at the cemetery were clearly visible from the kitchen window. Of course, I visited not once but twice. The first time was in the evening but as the headstones all face east, it wasn’t a good time for photos. I went back just before 10am the next morning with the sun shining on to the front of the headstones. As you scroll through this post, you will guess which photo was taken in the evening. While the cemetery was generally clear, around the graves wasn’t and it was difficult to get close to the headstones. I’ve since seen photos taken by Carol Judkins posted on her Carol’s Headstones Photos Facebook page in 2018 and I’m pleased to say, the graves were at least then, clear to walk around. 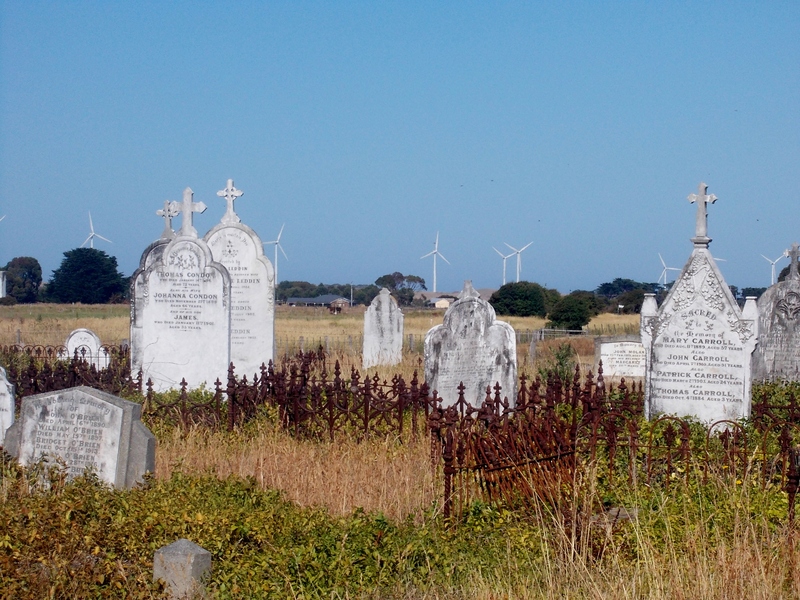 The view of the turbines at the nearby Codrington Wind Farm with the headstones in the foreground contrasts the old with the new. Below you will find the stories behind some of the headstones. I started writing these stories not long after I got home from Yambuk four years ago with intending to share my post soon after. However, it wasn’t long before I realised it wasn’t going to be that easy. Those buried in the cemetery are mostly of Irish descent, common for cemeteries in this part of the south-west. There were many people living in the same district with the same or similar name along with variations in spelling. Also, very few of those I chose to write about had newspaper obituaries to help work out who was who. Also, because I worked off the information on the headstones and not burial records, I can’t guarantee all of those memorialized are buried in the cemetery, I can only assume. It’s not uncommon to find a loved one remembered on a headstone even though their final resting place is elsewhere. 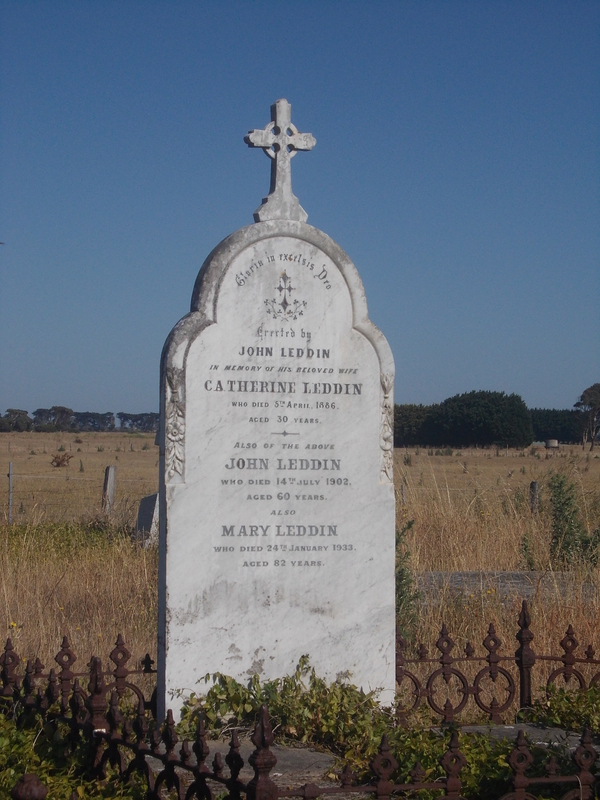 John Leddin was born in Limerick, Ireland around 1842, a son of William Leddin and Johanna Carroll. He arrived at Port Fairy with his parents on Chance in 1857 when he was fifteen, unable to read or write. In 1866, he appears to have gone to New Zealand. John was in Victoria in 1876 when he married Catherine O’Shannessy a daughter of John O’Shannessy and Johanna Hurley. Catherine was born at Yambuk in 1857. John and Catherine Leddin had five children, the first William in 1878 followed by a further two boys and two girls. The last was Johanna Magdalene Leddin in 1885. 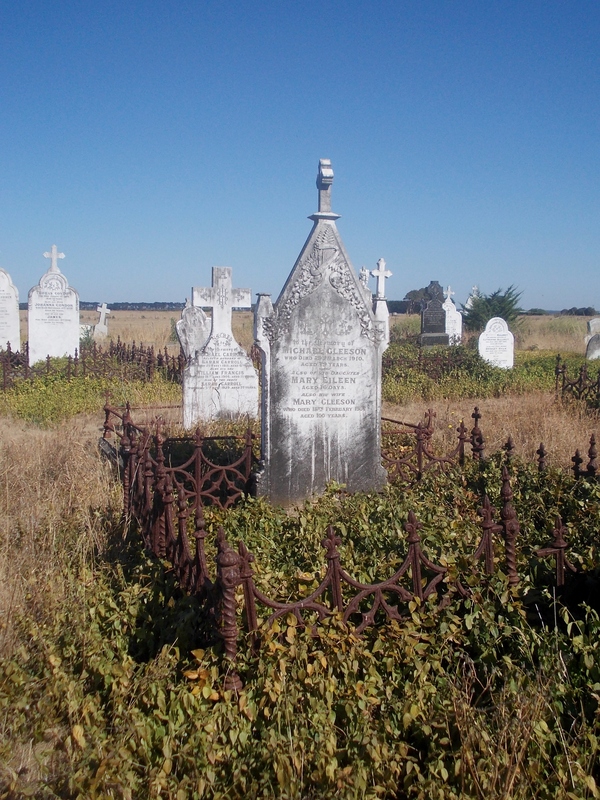 Catherine O’Shannessy died in 1886 aged thirty and was buried at the Yambuk Cemetery, leaving John with five small children, the youngest still a baby. In 1888, John Leddin remarried to Mary Anne Carroll, a daughter of John Carroll and Mary Crowe. She was born in Victoria in 1851. John and Mary had three children together, one girl and two boys. In 1902, while travelling to Port Fairy, John Leddin was thrown out of his buggy landing on the metal road on his head. He was taken to the Port Fairy Hospital with paralysis, cuts and bruises and died of inflammation of the spinal cord. He was sixty years old. John was buried with his first wife Catherine at the Yambuk Cemetery. 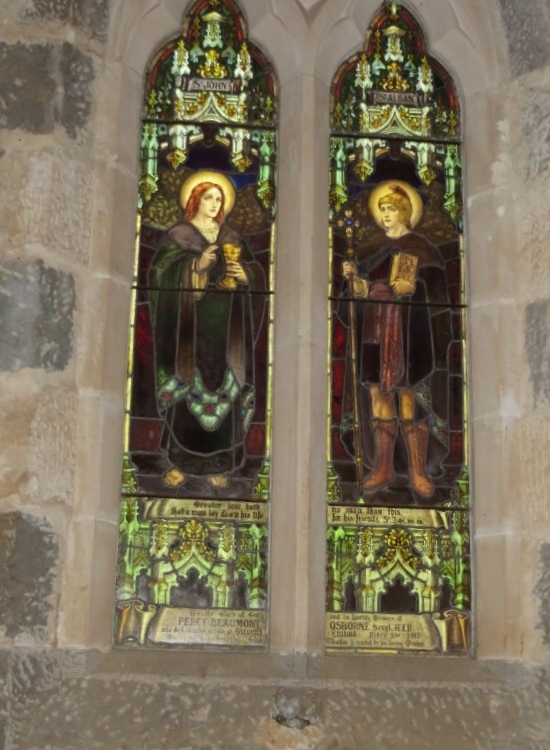 At the time of his death, John left his widow Mary, six sons and two daughters. In 1917, Patrick Leddin, a son of John Leddin and Catherine O’Shannessy was killed in France. In 1933, Mary Carroll died at Crossley and was also buried in the Leddin plot at Yambuk. I think I came across every possible variation of O’Shannessy while researching this grave. Catherine’s Victorian BDM’s Birth Index entry has her as Catherine O’Shaughnessy as did the entry for her sibling Matthew. When Catherine’s brother Daniel died, he was O’Shannassy. When Catherine died, her father’s name was given as O’Shannessy. Just as with Catherine O’Shannessy, there were variations in the spelling of Daniel’s surname. 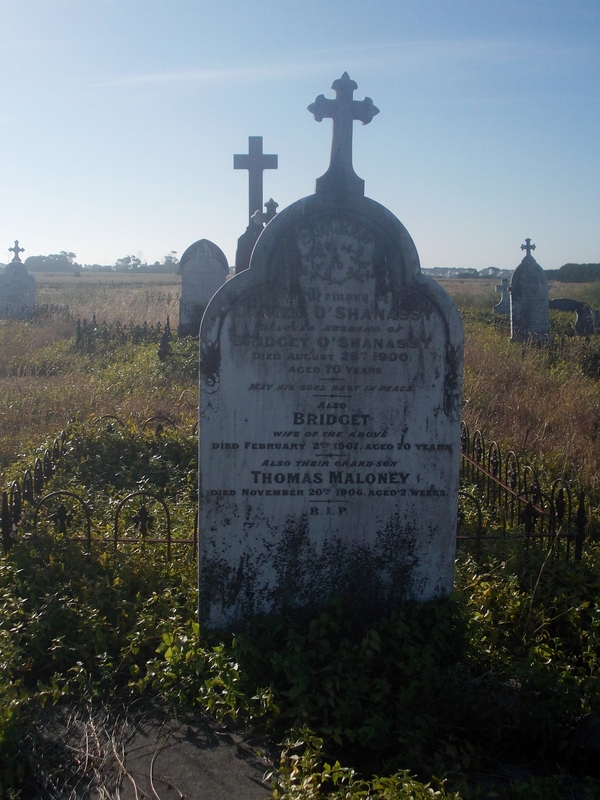 His grave shows O’Shanassy, but his Victorian BDM’s Death index entry, Marriage entry and PROV Probate File show O’Shaughnessy. Considering Catherine’s (above) birth was registered as O’Shaughnessy we could probably assume O’Shaughnessy was the original spelling for both Daniel and Catherine. Daniel was born in 1830 in County Clare, Ireland, a son of Daniel O’Shaughnessy and Judith Haden. Daniel and Bridget settled at Codrington, just west of Yambuk. Daniel died in 1900 aged seventy. Bridget died in 1907, and like her husband, I can’t be sure of her surname. Her Death Index entry shows her father was Dryer and her mother unknown, while her daughter Mary’s entry has her mother as Bridget Dwyer. However, son Daniel Thomas O’Shaughnessy and daughter Frances Judith O’Shaughnessy have Bridget’s maiden name as O’Dwyer on their Birth Index entry. Thomas Maloney was born in County Clare, Ireland around 1843. On 9 January 1865, Thomas married Catherine Ryan at Six Mile Bridge, Clare. They left for Victoria in the months after aboard Chariot of Fame arriving at Port Phillip heads on 2 December 1865. Thomas and Catherine settled at Yambuk and went on to have fourteen children. 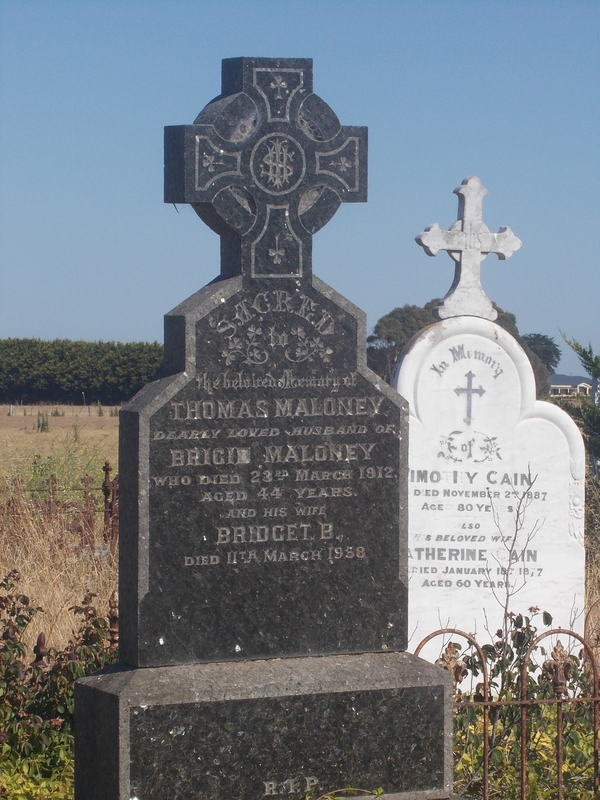 Thomas Maloney was forty-eight when he died at Yambuk in 1891. At the time, there were still four children under the age of ten. 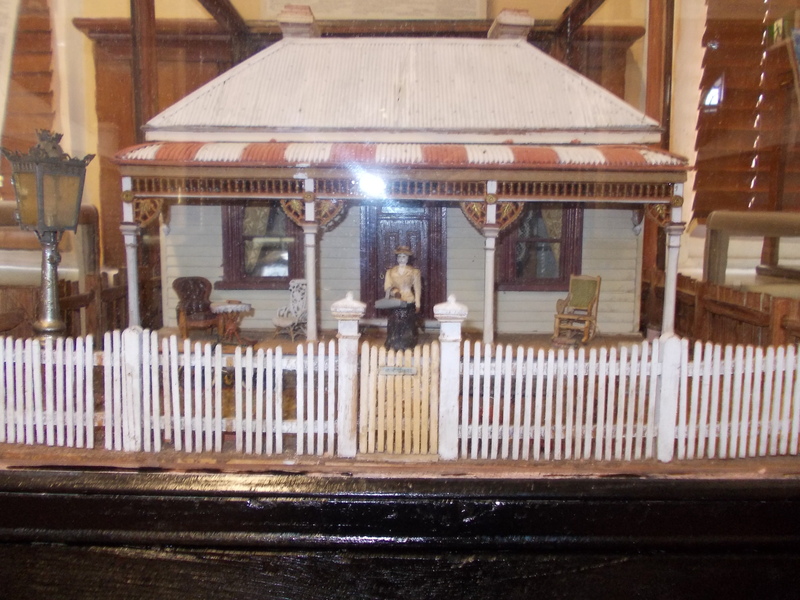 Catherine stayed on at Yambuk before moving to James Street, Port Fairy around 1911 to live with her son Daniel. That is where she died in 1916, aged seventy-two. Catherine was buried at the Port Fairy Cemetery. Thomas and Catherine’s son William was born at Yambuk in 1881. 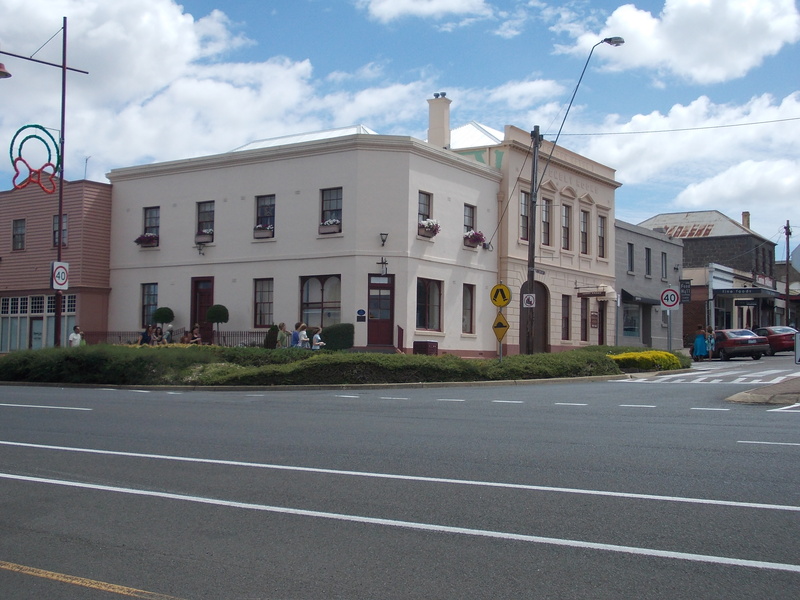 William had been in Wagga spending time with his brother Michael with a view to settling there. 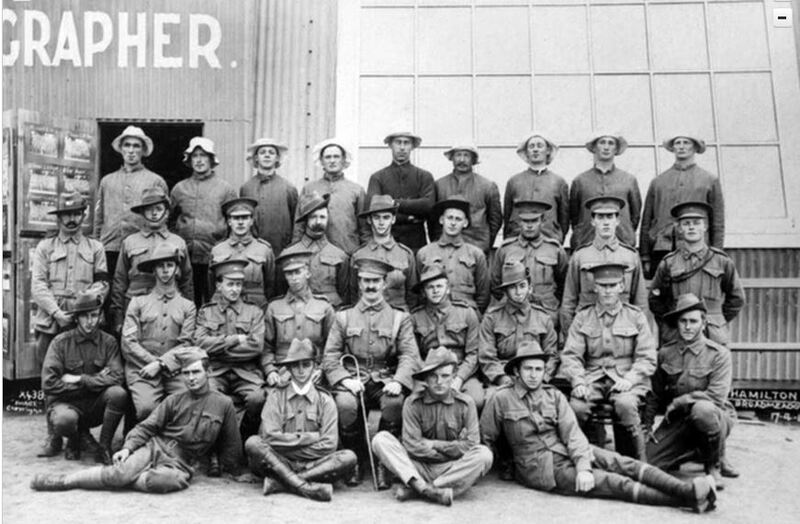 After a couple of months, William was struck down by gastritis and died at the Wagga Hospital in 1912 aged thirty-one. His body was returned to Port Fairy by train and former Port Fairy residents then living in Wagga including members of the Leddin family, were at the station to see his body off. 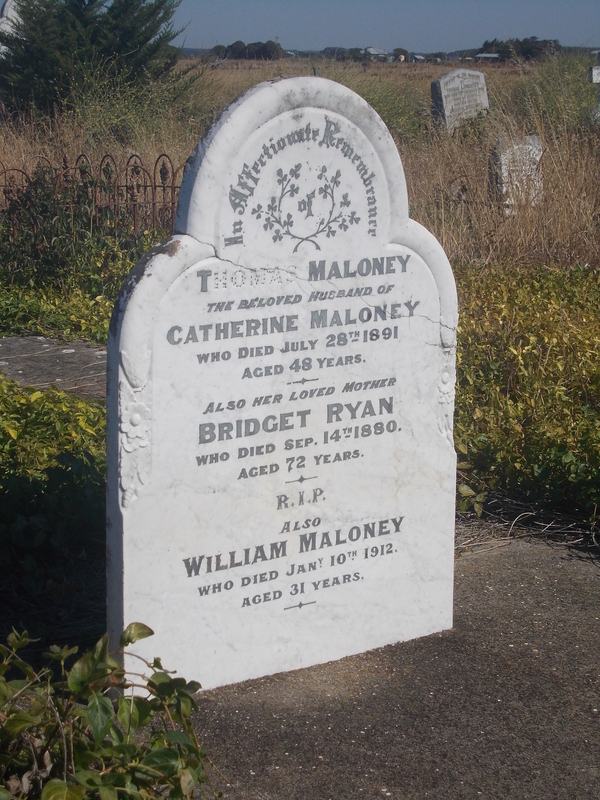 Also named on the headstone is Bridget Ryan who was Bridget Keogh, Catherine’s mother who died in 1880 aged seventy-two. Thomas Maloney was born in 1867 at Yambuk, a son of Thomas Maloney and Catherine Ryan (above). He married Bridget Beatrice Devereaux in 1910. Bridget was born at Port Fairy in 1870. Thomas died on 23 March 1912 at the age of forty-four. Bridget died in 1958. There appears to have been no children from the marriage. John Ryan was a son of Thomas Ryan and Bridget Keogh and brother of Catherine Maloney (nee Ryan) above. John Ryan was born at County Clare around 1837 and arrived on Eutopia to Adelaide in 1857. He went to Melbourne around 1860 before heading to Yambuk two years later. In 1867, John married Bridget Ryan. Bridget was a daughter of Michael Ryan and Hanora Barry and was born in Tipperary, Ireland. Bridget died in 1895 at the age of fifty-six. John died on 26 October 1918 aged eighty-one leaving one son, Thomas Ryan. James Gleeson was born in Ireland around 1841, a son of James Gleeson and Mary Carroll. He married Johanna O’Donnell in Victoria in 1868. Johanna was also born in Ireland in 1847, a daughter of Michael O’Donnell and Mary Corcoran. 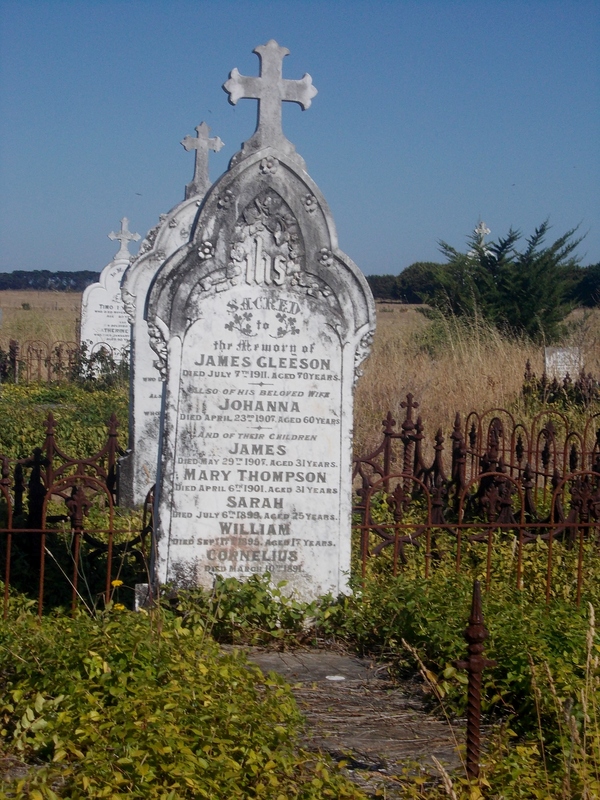 James and Johanna Gleeson had eight children, with five of those remembered on their headstone. 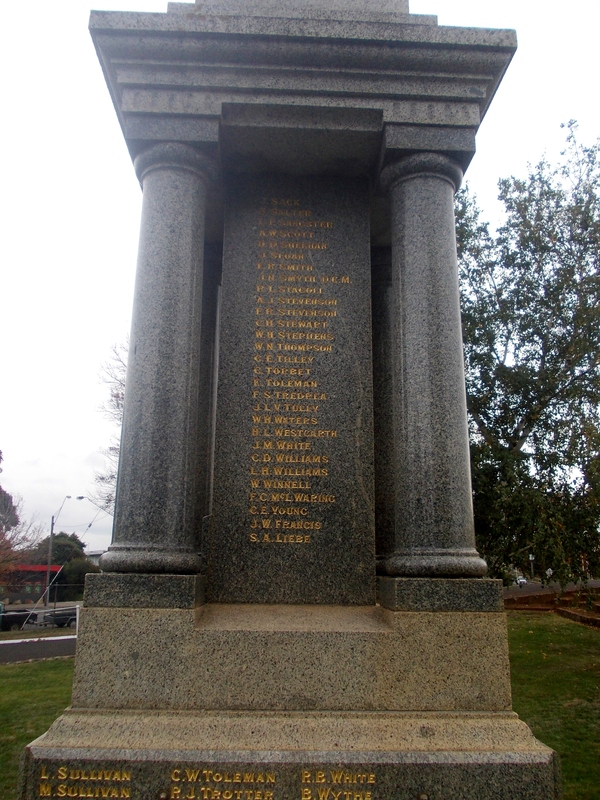 Cornelius died in 1891 at Yambuk aged eighteen and William Joseph Gleeson died in 1895 aged seventeen also at Yambuk. Sarah Agnes died in 1899 aged twenty-four at Yambuk. 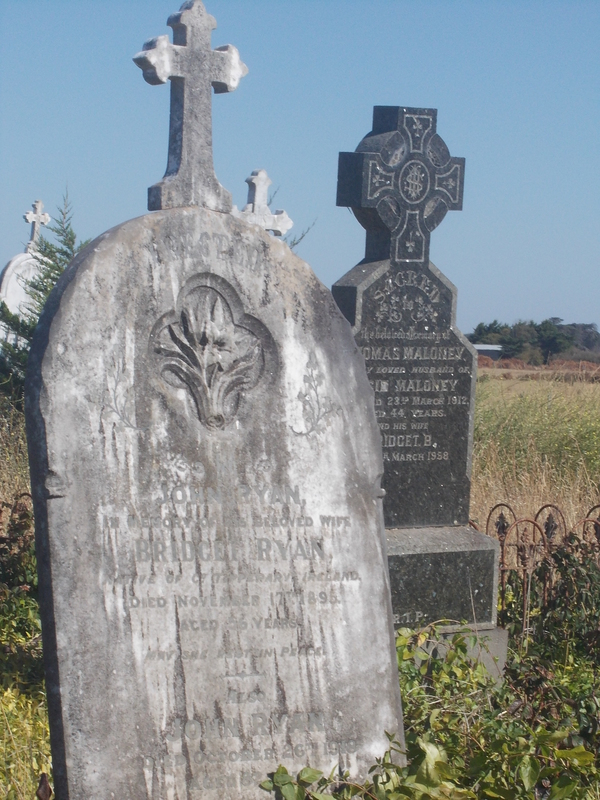 Mother Johanna died at Yambuk on 23 April 1907. Five weeks later, the Gleeson family were mourning again. 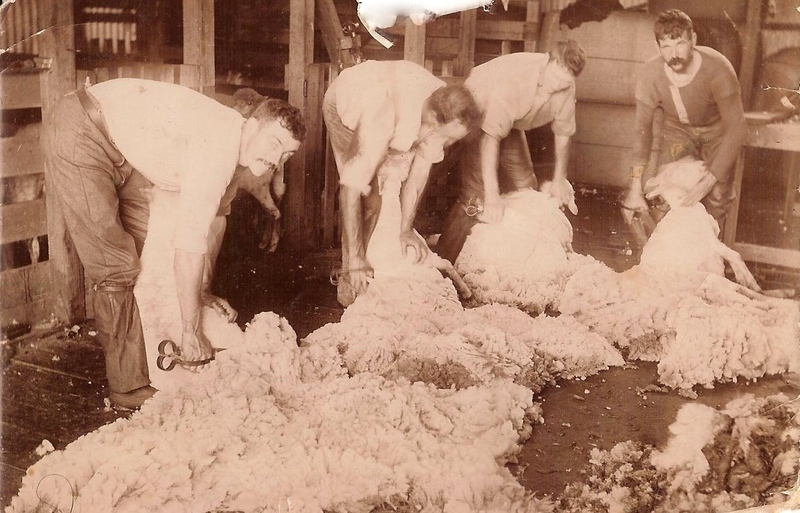 Son James died in 1907 at Merino aged thirty-two. He was working on a ballast train between Hamilton and Grassdale. He presented to a Merino doctor with severe stomach cramps after eating tinned fish. He died two days later on 30 May 1907 of food poisoning. He was thirty-two. 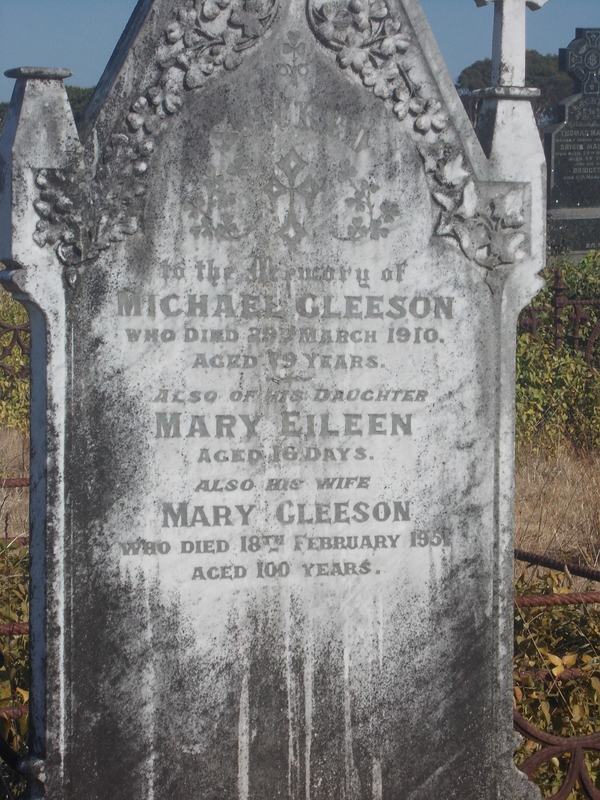 Also named on the headstone is a married daughter Mary Gleeson, born in 1869 at Yambuk. She married Alexander Thompson in 1897 and died in 1902 aged thirty-two. Mary and Alexander had four children during their short marriage. Their firstborn Mary died as an infant. Three further children were born, the last being Agnes in 1901. James Gleeson died at Port Fairy on 7 July 1911. Mary Gleeson (nee O’Donnell), was a sister of Johanna Gleeson (above). She was born in 1850 at Kilbane, County Clare, Ireland and arrived in Australia with her parents Michael O’Donnell and Mary Corcoran in 1870. Mary married Michael Ryan in 1884 and according to Mary’s obituary, they moved first to Gippsland and then on to Melbourne where Michael ran a greengrocer store in Spencer Street. They had one son William Michael Ryan, born in 1885. Michael died in 1888 aged around sixty-four. After Michael Ryan’s death, Mary married Michael Gleeson in 1890 and they took up land at Yambuk. Michael Gleeson was born around 1831. His Death Index record shows he was a son of James Gleeson and Elizabeth Carroll but seeing as James Gleeson above was a son of a James Gleeson and Mary Carroll, it may well be Mary Carroll was also Elizabeth meaning Michael and James Jr. were brothers…who married sisters…now I’m confused and no doubt you are too. Michael and Mary had a daughter, Mary Eileen who was born in 1891 but died sixteen days later. A son Michael was born in 1902. 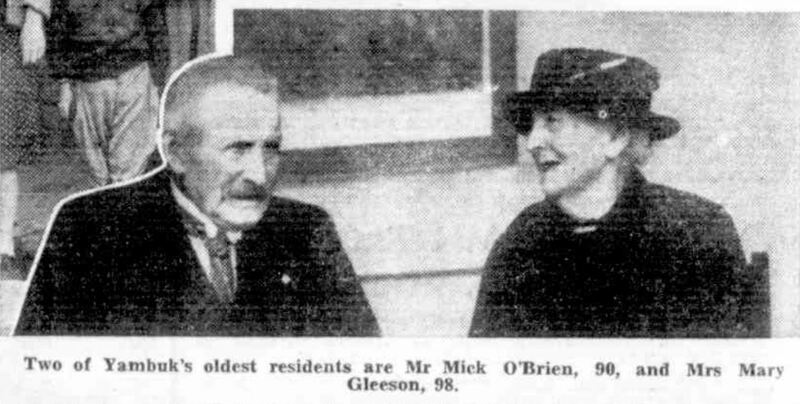 Michael Gleeson Sr died in 1910. Mary lived in Fingerboard Road, Yambuk the same road as the cemetery. She died on 18 February 1951 at Warrnambool the age of 100. She was photographed in 1947 with another old resident of Yambuk, Michael O’Brien (below). Being a glutton for punishment, I’m writing a Yambuk Cemetery Part 2 post and it’s proving no easier than this one. Hopefully it won’t take four years to write though so keep an eye out for it in the (hopefully near) future.